I had a chance to start working on my sawtooth star centres for the Star-y Log Cabin e-course I’m taking on Sunday. I couldn’t be more excited with how these blocks turned out! 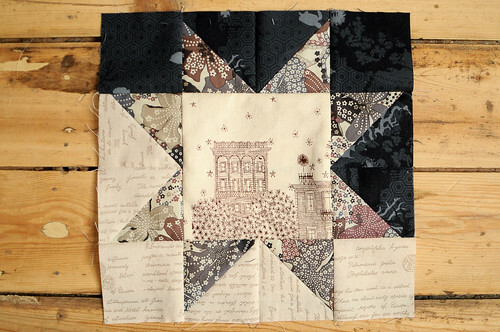 As I was working away, fussy cutting those cute buildings from City Limits, I kept thinking that this is a brilliant design for a quilt! The concept is so simple and classic, but Amanda‘s unique approach and execution are what totally makes it. 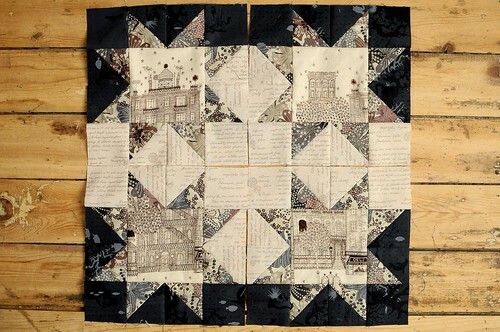 Amanda has been encouraging all her students to tell their own story with their patchwork and I’m really feeling a little story of my own coming together. Her weekly pdfs have been so energetic and full of great information that I can’t wait for them to arrive in my inbox each Thursday. This week I’ll be starting to add my logs!! love the combination of fabrics you are using. 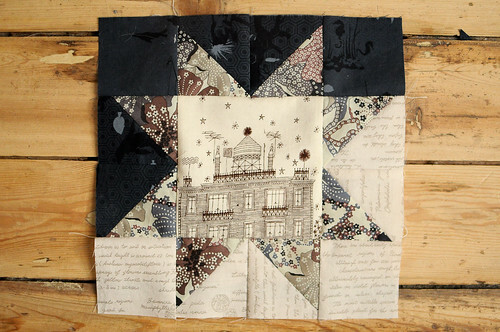 I love the handwritten fabric! 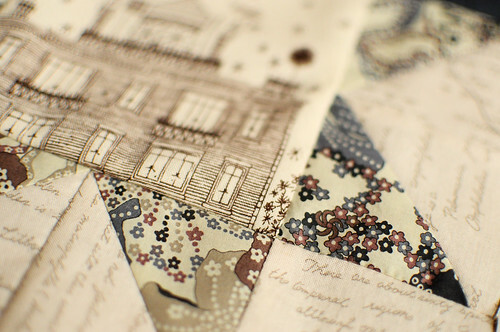 I think it goes quite well with the liberty print and the other prints you have chosen. Where did you find it? Oh … I just found your blog, obviously … I read back a few posts and figured out that you have your own fabric shop (I’m pretty envious!) so, duh. Can I buy some online? I’m nowhere near Toronto!! Every time I spot some of that Neptune fabric I’m instantly filled with jealousy. And I love this block! those look great! how big are the blocks? Just beautiful. Love the fabrics, love the subtle colors. Beautiful work! 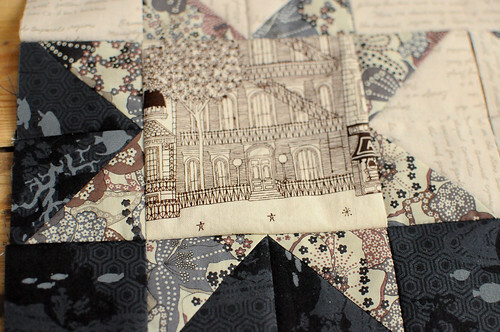 I love the fabrics you used; I can’t wait to see how the story evolves. SO gorgeous!!!!! These look awesome!!! I love the navy contrasting with the creamy-tan! 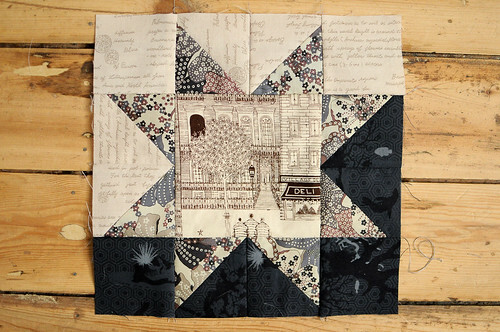 I agree that the Liberty print goes so well and really makes this block exceptional! I am very excited to see it completed!